One of my long-time favourite web publishers is springwise.com. It’s an international noticeboard of ingenious new projects, large and small – a self-described ‘essential fix of entrepreneurial ideas’. 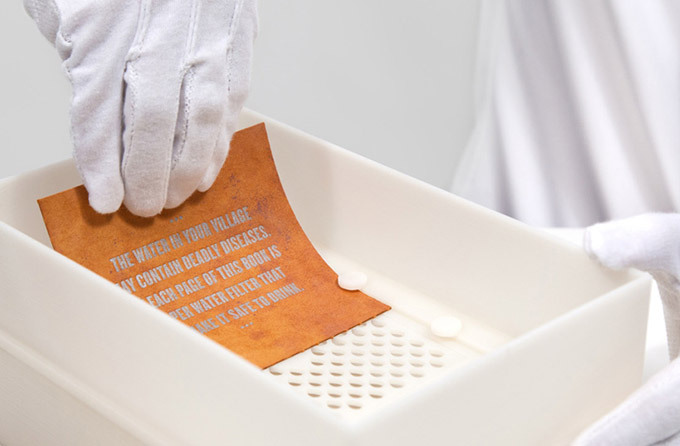 In its most recent weekly email, springwise included a new invention from the US: the drinkable book. This imagination-grabbing object mixes science with profound social benefit, design, marketing, and the old school hard-back book. It could prevent millions of deaths around the world, caused by waterborne diseases. The new kid/modern surprise in the drinkable book? It’s filled with pages that can be used as water filters. The pages/filters also feature printed info (done in food-grade ink) about sanitation and safe water practices. The box housing the book doubles as a water container. It started with scientist Theresa Dankovich’s invention of paper coated with silver nanoparticles. When you pour contaminated water through this paper (just like a coffee filter), 99.9% of the bacteria is destroyed, resulting in water that’s safe for drinking. 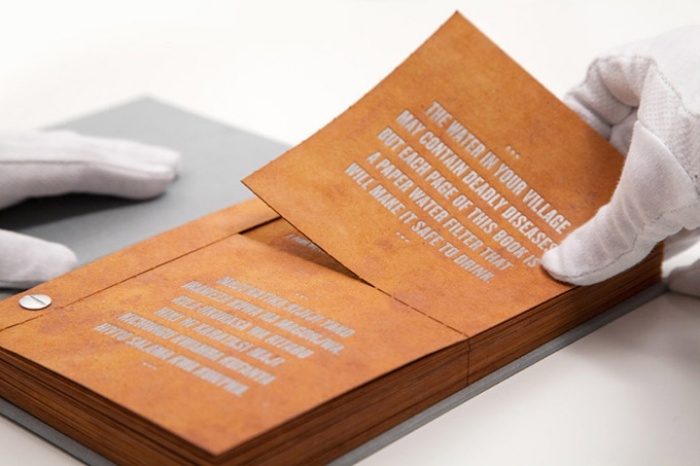 Working together, international non-profit Water is Life, Dankovich, the University of Virginia, Carnegie Mellon and DDB New York came up with the drinkable book. One book contains enough filter paper to supply one person with four years of clean drinking water (each page filters enough water for 30 days). Don’t you love it when science and design join forces to address an urgent social need? And the fact that this collaboration’s resulted in an engaging and hardy book-like object is a fantastic added bonus. The current run of drinkable books is printed in English and Swahili, and is headed for Kenya. And while the drinkable book is only at the start of its journey to those who’ll use it, here’s hoping that the technology it contains lasts and lasts; becomes available easily and quickly; and works without a hitch, wherever it’s needed. Reblogged this on upcycle blog.